PlayTech were established in 2000 and quickly made an impact in the online casino industry, so much so that the company floated on the London Stock Exchange in 2005. The company is renowned for both their wide range of games and the high quality of these games – and you’ll find all of your casino favourites at PlayTech, including of course, Video Poker. In this article I look at all of the Video Poker games offered by PlayTech. I start by examining the three most popular Video Poker varieties and explain the key differences between them. 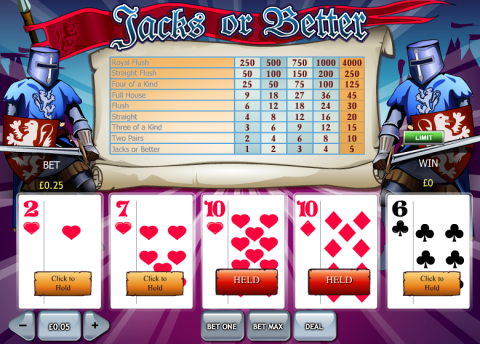 I then move onto a summary of the other Video Poker games, and give an overview of the range. I finish with a recommended online casino where you’ll be able to enjoy PlayTech games. You’ll notice immediately that the games offered at PlayTech are not designed to look like the Video Poker terminals in land based casinos – which is a different approach to other online casinos. For players who want the authentic experience, this might be a downside, but the games do look good, and for me, these games offer a better gaming experience. As well as the standard games you’ll also find varieties where you’ll be able to play more than one hand at a time – 50 lines ‘Jacks or Better’ for example. After every winning hand you’ll be offered the chance to ‘double’ when playing Video Poker at playTech – some players may like this option being shown every time, while others might find the option a little intrusive. This game is called Jacks or Better due to the fact that you’ll need at least a pair of Jacks to win money on the pay table. This game features no wild cards or jokers, so you’ll be playing with a standard 52 card deck. The PlayTech variation of ‘Jacks or Better’ offers the full 9/6 payout (called this due to the size of the payouts on the Full House and the Flush) which is equal to the best you’ll find online. In ‘Deuces Wild’ all 2’s are wild cards, meaning that you’ll find a stronger range of hands in this game. Due to this, you’ll need at least 3 of a Kind to make the pay table. You’ll also find ‘5 of a Kind’ here due to the wild cards and differing payouts for a ‘Natural Royal Flush’ and a ‘Wild Royal Flush’. Joker Poker features a 53 card pack, with the standard 52 cards and a joker. The joker acts a wild card, and like ‘Deuces Wild’ you’ll also find ‘five of a kind’ and differing payouts for the natural and wild royal flushes. Due to there being just one wild card, you’ll need a pair of Kings or more to make the pay table in this game. When playing the multiple versions of the game, you’ll receive your original 5 starting cards and ‘hold’ your selection as normal, but these held cards will play out in all of your hands. For example, if you are dealt a pair of Kings in your original5 cards and decide to hold them, you’ll have at least a pair of Kings in every hand – although of course it might improve in some of the hands. You’ll also find progressive Jackpot games in the PlayTech range – such as MegaJacks, where you’ll win the Jackpot when hitting a Royal Flush. The PlayTech Video poker range is a strong one, with a good range of classic games and options where you can win progressive jackpots and play many hands of poker at once. One area that is missing is bonus games, where you might find extra payouts for various types of 4 of a Kind, so fans of these game will miss out – however the rest of the range do more than make up for this. These games are very playable, and it’s hard not to recommend PlayTech video poker. You’ll be able to enjoy the PlayTech casino suite at the Betfair casino. This casino is one of the most impressive online, with a great range of very playable casino favourites as well as many original games. You’ll also find a live casino here, where you can play roulette, blackjack, baccarat and casino hold’em with a live dealer. When joining Betfair casino you can enjoy several bonuses. Firstly, there is a £5 no deposit bonus where players can play for real money without risking a penny. Secondly players can enjoy one of three welcome bonuses – with a 200% match bonus up to £300 available to players of all games. Check out www.betfair.com for the latest offers.